The issue of Tibet is a remnant of the Great Game. Only now the playing fields are a tiny town in northern India and the Great Hall of People via Hong Kong. For the past decade or so the Tibetan issue has taken unfathomable twists and turns, from Independence to one country with two systems, from genuine autonomy to association with China. After forty years, we are at our wits end, having tried everything, it seems, except to stick to the struggle for independence – which is rightly ours and wrongly snatched from us. The struggle for independence is not a fancy show in a dream theatre. It is bitter fight for truth that consumes lives and takes generations. China is a millenarian thinker and so are her policies. Our struggle for freedom must be based on the understanding of this fundamental concept. Given the Dragon’s appetite, he will not be satisfied even if we kow-tow before him. China desires nothing less than complete fealty from us, which we, as a dignified race with an ancient history, cannot fulfil. Can we turn a blind eye to the sacrifice that our heroes have made? Does our history mean nothing to us? Does freedom mean nothing to us? Mr. Lhasang answers some of these questions in Tomorrow & Other Poems. After a long drought of mediocre poetry books that starved us of poetic prowess, Tomorrow & Other Poems is a refreshing shower of rain. Tomorrow & Other Poems is a collection of poems by Mr. Lhasang Tsering. Like the man himself, it is a distilled and pristine human experience. It has neither an over-play of highfalutin words nor complicated principles. His words are clear-cut, his expression simple. 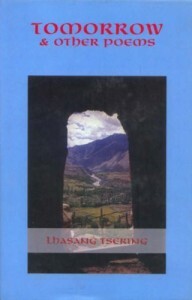 Through his poems Mr. Lhasang gives a clarion call for FREEDOM for Tibet. Only a few books I have read without a break – this was one of them. I was doused with fire and drowned in tears. It is a testimony of common men’s experience as refugees in a foreign country and subjects in an occupied country. In a Diaspora where ordinary compatriots are confused by heading-nowhere political strategy, his words are beacon lights. He gives a voice to thousands of voiceless refugees, who desire nothing but to return to their native land… to a free and independent Tibet. And on my final day I’ll die in free Tibet. The focus of the book is explicit. It is a breathless freedom marathon. He does not suffer from any of the ailments of which poets are likely to suffer like romanticism, philosophising, hyperverbosity or rhymes overshadowing the theme. Reading Tomorrow & Other Poems can maim you, punch you and be warned… it can change you. He is a true Pak  and Chang  poet. His love for Tibet is boundless and he himself is something of a legend. My school-boy awe and wonderment for him still reigns. But he is a frustrated man. His frantic call for freedom for Tibet is shunned by mainstream politics and is mockingly termed as “harping on an empty word.” Yet he lives with hope as HOPE is a staple for displaced people. He hopes against hope. Hope for hope. Hope for the impossible. Why not hope. After all, for a man whose tomorrow is uncertain, hope is the only thing. Though his name is synonymous with violence,  in Tomorrow & Other Poems, Lhasang Tsering shows his gentle side. Fall short in her eyes? Like a true Tibetan he mingles unique Tibetan culture and beliefs into his poetry. Freedom for example, is constructed in the shape of a Buddhist stupa, the symbol of Dharmakayu. When Buddha passed away, his disciples constructed a dome shaped stupa to preserve the remains of Buddha Shakyamuni and more importantly to represent his enlightened mind. In Freedom Mr. Lhasang asserts why a man must have freedom to live a dignified life. The freedom he talks of is ’an earthly freedom’ which one must fight for with blood, tears and toil, for it does not come through meditation. Others for earthly freedom will die. An Ode in 21 Verses, I assume, is appropriately penned in twenty-one verses like the twenty-one Taras. Tara, ’saviouress’ or ’she who liberates’, is the embodiment of Buddha’s fully enlightened mind and, hence, she is spoken of as the mother of all the Buddhas. Like Tara, An Ode in 21 Verses, is the quintessence of Tibetan tragedy. It is overpoweringly passionate. It is a testimony to the suffering of Tibet, especially the unknown heroes who fought and sacrificed their lives. The poem’s clarity and rhythmic sorrow attest to Mr. Lhasang’s personal experience with the pain of those who died fighting and the agony of those languishing in jails. There are many poems that ought to be incorporated into the Tibetan school curriculum. This is one such. The pain of writing with intense feeling is only matched by the pain of living without a country. Ode to a Freedom Fighter has seven verses like the seven water offering bowls that all Tibetans set on their altars. It is a frank recognition of the supreme sacrifice made by the warriors gone by. It is also a direct challenge to the middle-path approach of waiting for negotiation to resolve the future status of Tibet. Mr. Lhasang’s freedom is not simply about our return to Tibet. His freedom is a vision, in which our children can live in Tibet without having to bow their heads. We have seen the ’iron curtain crash’ and the liberation of East Timor; then why must we believe that the ’bamboo curtain will remain forever’. Yet ’association’ is the mantra being dutifully chanted. We have forgotten our past glory and given up on our future hope. Our heroes died for nothing. We betrayed them. A new history we have begun. Freedom is a dirty word, you will find to your regret! Despair not, my friend for there is hope yet. The road may be long and winding. Many of our leaders may be confused and short-sighted. But the will of the people will prevail. Truth must triumph. We, the youth and future of Tibet, firmly stand for dignity and freedom for Tibet. Freedom most certainly is not an empty word. ’Pak’ is dough made from Tsampa using water or tea. Tsampa – the staple diet of Tibetans is flour made from roasted barley. Other grains may be used in absence of barley. He never advocates violence as the only means, but he reserves it as a last resort to fight for independence and self defence.